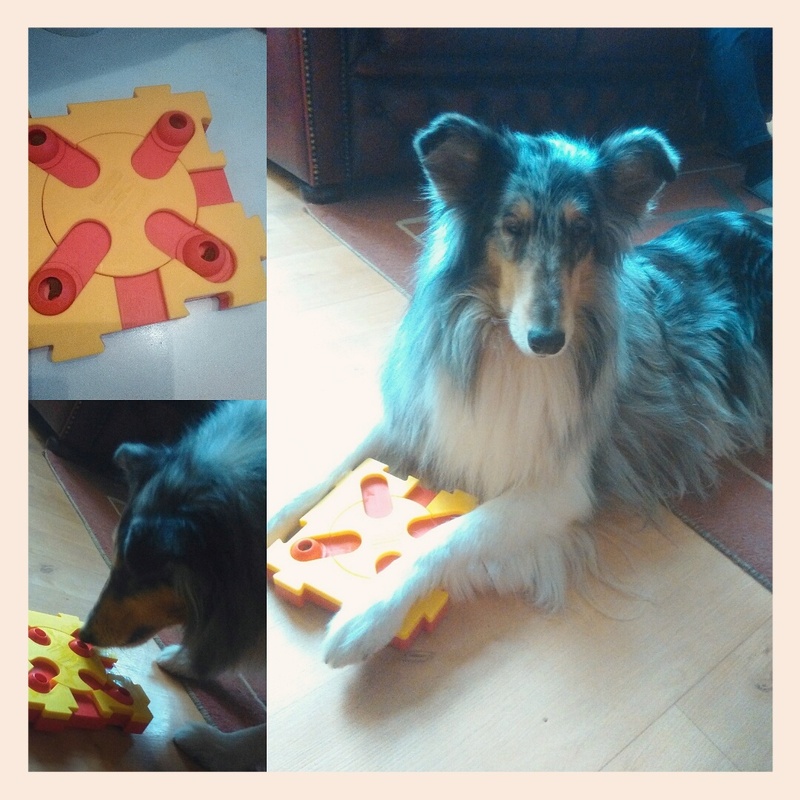 When I buy a dogpuzzle or game I immediatly think of Vivien, she is the best puzzlestar of them all. And this puzzle she tried once at a dogshow. At this show they displayd the puzzles on the floor, and Viv loving that, just started making it. This puzzle is very nice when you use it as one part, but you can build a bigger game out of it, when you buy additional ones, to make a very big challenge for the dogs. I only have one part, and I bought it in sale because they can be a bit expensive, but on the other hand, if there is something that is heavily chewed on, you can buy new parts for your game so that is pretty cool. Then you wouln't have to trow the whole game away. It is made of sturdy plastic and Scarlett really chewed on it, and there are almost no teethmarks in the plastic, so that is great. This is a pretty advanced game, but Scarlett isn't really a dog for games, so she had a hard time making this one. But if your dog likes games and puzzles like Vivien this one is a nice one, and with buying more games and making a big puzzle you can really lett their brains work. Nina Ottoson is a Swedish brand and I checked her site! wow, there are so many great games, and all of great materials. Almost every dog can do a puzzle, and it is great to see your dog succeed. active with your dog doggame dogpuzzle dogtreats interactive game nina ottoson product review video!! Labels: active with your dog doggame dogpuzzle dogtreats interactive game nina ottoson product review video! !